Ahhh... baguettes. I love how they can go from having a crisp exterior with a soft interior one day to being ridiculously hard the next. Regardless, going through the process of making these is well worth it. They go well with almost any meal and most people really like them. Oh! Let me give you guys my secret. In order to stop them from going hard, I put them inside plastic bags, like the Publix or Walmart bags. It helps keep them fresh for some time. For this recipe, Williams-Sonoma: Bread offers two side notes. 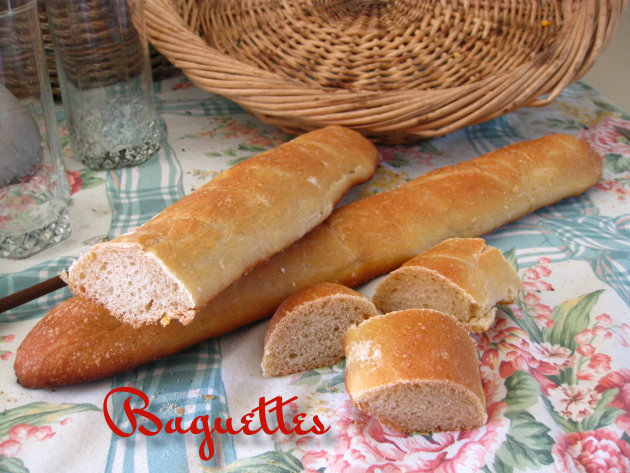 "BAGUETTE PANS: You will need 2 dark metal baguette pans to make this recipe. Each baguette pan has 2 curved loaf cradles measuring 2 3/8 inches across. The center ridge is perforated to allow for good heat circulation. These pans ensure that you will have perfect, crusty loaves every time you make this recipe." "VITAL WHEAT GLUTEN: Vital wheat gluten, a substance naturally occurring in wheat, adds body and volume to yeast breads, especially those made with whole-grain flours. Sold in powdered and concentrated form, vital wheat gluten ensures a high-rising, light-textured loaf. The general rule is to add 1 teaspoon to 1 tablespoon of vital wheat gluten per cup of flour, depending on the flour's gluten content (bread flour needs less; heavier whole-wheat and nongluten flours need more). Vital wheat gluten is available in the baking section of well-stocked supermarkets and by mail order." 1) In the bowl of a heavy-duty mixer fitted with the whisk attachment, sprinkle the yeast over the water. Add 2 1/2 cups of the flour and beat on medium speed until smooth, about 1 minute. Cover the bowl loosely with plastic wrap and let stand at room temperature until bubbly, 2-3 hours. 2) Fit the mixer with the dough hook. Sprinkle in the salt, 1 1/2 cups of the flour, and the gluten. Beat for 2 minutes on low speed, then increase the speed to medium. Beat in the remaining flour, 1/2 cup at a time, until the dough is smooth, yet sticky enough not to pull away from the bowl sides, about 2 minutes. Knead for 8 minutes longer on low speed to form a moist dough ball. Do not add more flour. 3) Using a plastic dough scraper, scrape the mass of dough into an oiled deep bowl and turn the dough once to coat it. Cover loosely with plastic wrap and let rise at room temperature until tripled in bulk, 3-3 1/2 hours. Punch down the dough, turn it to coat again with oil, cover loosely with plastic, and let rise again until tripled, about 2 1/2 hours. 4) Grease 2 baguette pans, each with 2 loaf cradles, 17 3/4 inches long by 5 1/2 inches wide, and sprinkle with cornmeal. Use the plastic dough scraper to scrape the dough out onto a floured board. Knead a few times with the scraper to incorporate just enough flour (no more than 1/4 cup) to be able to shape the loaves. Divide the dough into 4 equal portions. 5) Sprinkle the board with more flour and shape each dough portion into a 12-by-6-inch rectangle. Beginning at a long side, roll up each rectangle, using your thumbs to help roll it tightly. Press each roll to flatten it slightly. With the side of your hand, define a depression lengthwise down the center of the dough log. Fold the dough over again lengthwise to make a tight log and pinch the long seam to seal. Stretch each log by using your palms to roll it back and forth on the board a few times until it is about 15 inches long and 2 1/2 inches wide. Tuck the ends under. Quickly and gently transfer each log to a prepared pan, laying it, seam side down, in the cradle and adjusting the dough to fit into the pan. No dough should hang over the ends of the pan. Sprinkle the tops with flour. Cover loosely with plastic and let rise at room temperature until 2 1/2 times its original size, about 1 1/2 hours. 6) Place a baking stone on the center oven rack and preheat to 450F. Using a thin, sharp knife, make 4 or 5 shallow diagonal slashes along the length of each loaf. This must be done gently, as the delicate dough will deflate slightly. Lightly brush the tops of the loaves with cold water. Place the pans on the stone and reduce the oven temperature to 400F. Bake until the loaves are crusty and brown and sound hollow when tapped, 30-35 minutes. Transfer the loaves from the pans to wire racks to let cool slightly. Serve warm or at room temperature the same day they are baked. Wow that looks perfect! I have never made baguettes myself, I'm afraid it won't be as good as from a bakery, but yours looks very prof! Oh trust me, it's not hard at all! The hardest part is maybe making the molds yourself; I wasn't sure about this recipe since it was my first time making baguettes, so I didn't bother buying the molds. I had my dad make them for me since he had some tin that had the basic baguette shape. They taste amazing, just like the bakery. You won't be disappointed!